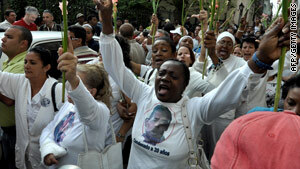 This week's marches coincide with the release of an Amnesty International report critical of Cuba. Chants of pro-government marchers drown out protesters' calls for "freedom"
Havana, Cuba (CNN) -- Hundreds of pro-government demonstrators in Havana, Cuba, chanted "this street belongs to Fidel" as they surrounded a slow-moving march of human rights protesters Thursday. The Ladies in White, as the human rights protesters call themselves, meandered down streets in the old section of the Cuban capital, drawing onlookers and pro-government demonstrators who drowned out the ladies' cries of "freedom." Thursday marked the seventh anniversary of a major political crackdown in Cuba in which the government arrested 75 dissidents. The women have staged marches throughout the week, demanding greater political freedom and the release of dissidents who remain imprisoned. On Wednesday, a similar march drew hundreds of pro-government demonstrators. Plainclothes security agents and police officers closely monitored the scene as demonstrators swarmed the small group of marching women. Thirty of the women were forcibly detained, dragged onto waiting buses by female security officers. They were immediately driven home. This week's marches also come on the heels of two dissident hunger strikes that drew international attention. Last month, Orlando Zapata Tamayo, who was jailed in 2003 during the crackdown on political opposition, died after a hunger strike that lasted for more than 80 days. He began the strike to demand better prison conditions. In an unprecedented government statement, Cuba President Raul Castro "lamented the death of Cuban prisoner Orlando Zapata Tamayo, who died after leading a hunger strike." He blamed the United States for the death, but did not explain why. "Tortured people do not exist," Castro added. "There were no tortured people. There was no execution." Another dissident, Guillermo Farinas, took up a hunger strike last month, demanding the release of 26 ailing political prisoners. "I am ready to die," he said, looking frail among friends and family at his home in Santa Clara, Cuba, last week. Cuba says it has no political prisoners, calling many of the dissidents "mercenaries" being paid by the United States and other countries to undermine the government. They say the fact that a U.S. diplomat turned up at each march this week is evidence of U.S. involvement in dissident activity. This week's marches also coincide with the release Wednesday of an Amnesty International report that calls on the Cuban government to revoke laws that restrict freedom of expression, assembly and association and to release all political prisoners. Amnesty International also asked Castro to allow United Nations experts and representatives from other human rights organizations access to the island to monitor civil liberties. Before the demonstration Thursday, Amnesty International urged Castro to ensure the safety of a group of female relatives of prisoners of conscience.